Bellevue, Washington, is a one-of-a-kind place that offers the ultimate in shopping, dining and cultural attractions, surrounded by natural beauty and outdoor spaces. Miles of nature trails, public parks and swim beaches are walking distance from downtown for a workout or unwinding. Numerous spas, museums, and art exhibitions are located in Bellevue. Seattle is our biggest and most well-known neighbor, located just across Lake Washington to our west and home to many of the iconic symbols of the region. In addition, Bellevue’s neighbors on the east side of Lake Washington (King County’s east side) include Woodinville, Kirkland, Redmond, Issaquah, Bothell, and Snoqualmie. Go whale watching in Seattle! Enjoy the experience of a lifetime with Seattle’s only half-day, guaranteed whale watching tour. 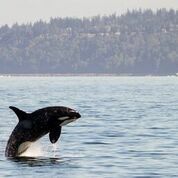 On this premier excursion, see orcas, humpback whales, and all the majestic wildlife in the San Juan Islands on our tours operating from the Edmonds Marina – just minutes north of downtown Seattle. Departing twice daily at 9:30 a.m. and 2:30 p.m.